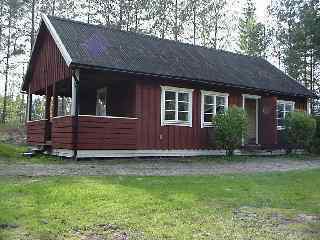 A traditional Swedish house, set in a picturesque large site next to a small lake and located in central Sweden, Varmland, this is an ideal base for touring and is popular with bikers, on good uncrowded roads (like England 40 years ago! ), with beautiful forests, open areas and lakes for swimming or fishing. Self catering facilities include accommodation for up to 11, with usual facilities along with a sauna, bbq and freshly laundered bed linen provided. 10 minutes to local shops (pizzeria, bar, shops, bank etc) and Ransäter which has festivals such as Swedish mid-summer. Also close to Karlstad with excellent shopping, restaurants or to Sunne a large town with Rotteneros Park, the Harley-Davidson Museum and Sunne Vattenpark with excellent swimming pools. The owners, Jo and John, originally from London, welcome you and can assist you with local routes, information on places to visit and their love for all things Swedish. Use of garage and bike washing facilities. Secure parking. Can you recommend a Biker Friendly place to stay which is not listed?